LDI features ET Live, a live demo of audio systems.NEW YORK, NY--The 2007 LDI trade show and conference for visual and sound technologies, will feature an expanded focus on professional audio and live sound production November 16-18, at the Orange County Convention Center in Orlando, FL. 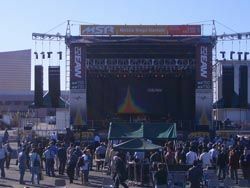 LDI's ET Live's annual outdoor exhibits will offer live entertainment demonstrations of concert sound products in a real world outdoor performance stage environment. Open to all LDI trade show attendees, ET Live exhibits give professionals interested in purchasing concert sound systems and staging the opportunity to experience products without the limitations of an indoor environment, room size, reverberation reflections, frequency build-up, and other factors. ET Live's six loudspeaker sponsors will demo their line-array speakers, console manufacturers will set up at their FOH position, staging companies will present multiple concert stage configurations and large screen monitors and lights will illuminate the performances. In addition, LDI will offer expanded professional audio education seminars. Presented by Syn-Aud-Con, "Sound Reinforcement for Operators" will take place November 12-13, followed by "Sound Reinforcement for Technicians" Nov 14-15. A full menu of live sound conference sessions on Nov. 12-16 will include "RF Spectrum Dilemma," "Line Array Design and Application" and "Working with a Sound Rental Shop," as well as "Training the Sound Designer" and "Introduction to Digital Audio".